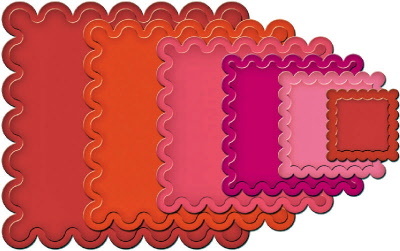 Set of six Nestabilities® die templates. There are seven ½” wide scallops on each side of the largest die template, and scale down as the die templates decrease in size by ½”. This set coordinates with the S4-126 Classic Squares LG, S4-129 Classic Scalloped Squares SM, S4-196 Classic Inverted Scalloped Square LG and Decorative Elements. The difference between die template sizes within a Nestabilities set is ½”, which becomes a ¼” border when layering. The difference between LG and SM Nestabilities sets is ¼”. Combining both the LG and SM sets of Nestabilities will allow for 1/8” borders when layering.